Many patrons enjoy using more than one of our County library locations on a regular basis. Sometimes it’s simply a matter of convenience since items can be checked out and returned to any location. Other times, it’s a particular library program or community meeting that’s the draw. Our area’s beautiful Spring is a great time to visit other locations just for a change! For example, enjoy the scenery on your drive to the Jane G. Sauls Ft. Braden Branch and take a peek at the neighboring community garden's progress. Consider stopping in at the cozy Woodville Branch on your way to or from destinations South of Tallahassee; or pop in the branch’s back door when you take a break on the St. Marks Trail. Plan a walk around Pedrick Pond Park when you visit the Eastside Branch Library. (And on March 23, head a little farther down the road from this branch to experience Leon County’s Sustainable Community Summit event at the J.R. Alford Greenway from 9 a.m. to 1:30 p.m., For more information, visit: www.GrowingGreen.org/Summit2019) Each of our 7 libraries has a unique look and feel, great in any season. I hope you’ll explore them all. We’re exploring some new things, too. “The Book is Better” book club, hosted by the County Main Library, is trying a new meeting time – 11 a.m. – and a new venue, Au Peche Mignon’s downtown location (no purchase necessary). If you enjoy books and movies, especially books made into movies/movies based upon books, this is for you! 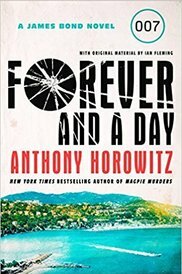 The book club meets on the 4th Tuesday of each month. Their book selections are included on the library’s book clubs calendar at http://cms.leoncountyfl.gov/Library/Calendars/Book-Clubs-for-All-Ages . Before heading out to enjoy the beauty of our area and the multitude of great Springtime activities, take time to check out or download books, audiobooks, movies and more. Tell us – and your friends and family – what you’ve read/listened to/viewed and what you liked or didn’t like. Readers are energized by other readers – let’s share and have fun! 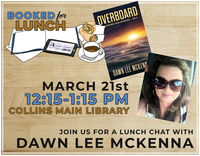 Author Dawn Lee McKenna will be the speaker at the Booked for Lunch program on Thursday, March 21 at 12:15 p.m. at the Main Library. 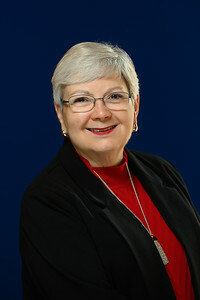 She is the author of the popular Forgotten Coast series which takes place in and around Apalachicola. She will talk during the lunch hour on her craft and take questions from the audience. Booked for Lunch is a program funded by a generous grant from Walli Beall, who has supported the Library for decades. Patrons can enjoy a lively talk from popular authors while eating their bag lunch. Refreshments and desert will be provided by the Library. 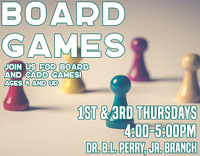 Gaming Fun at your Library! Come out to the Woodville Branch Library on March 12 and March 30 at 3:30 p.m. for gaming fun with the Oculus Rift Virtual Reality System, along with conventional card and board games for more family fun! Great gaming fun also comes to the Dr. B.L. 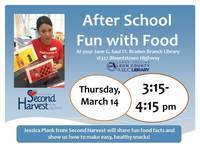 Perry Branch on the March 7 and March 21 at 4 p.m. as well as the Lake Jackson Branch on March 9 at 11 a.m.
Jessica Plank from Second Harvest will be at the Jane G. Sauls Ft. Braden Branch Library on Thursday, March 14 at 3:15 p.m. to show how to make easy and nutritious snacks. When you're out and about enjoying the Springtime Tallahassee festivities, please come by the Spring Title Wave Book Sale at the Main Library on Saturday, March 30 from 9 a.m. to 3:30 p.m. in the Library's garage a long Bronough Street, on the side of the building. This exhibit is in commemoration of National Youth Art Month and in partnership with Leon County Schools. Artwork on display is from K-5 students at the Main Library throughout March. Why art? Our young people today, more than ever, need the arts as a forum for communication, imagination, safe expression, exploration, and historical and cultural understanding. 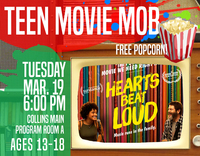 Teens are invited to watch “Hearts Beat Loud” at the Main Library, Tuesday, March 19, 6:00 p.m. Teens, come enjoy free popcorn! This is one of many movies offered as streaming video through Kanopy. Each library card owner may watch four movies every month for free! See our online calendar for more teen events. Enjoy hands-on science activities every third Thursday at the Main Library. This program is offered by the MagLab and designed for 1st-5th grade students (though all ages are welcome). Monday, April 22 is Earth Day, a holiday promoting awareness of and support for environmental protection. The library has many materials that can assist you in living a greener lifestyle. Check out The Green Interview series on our new streaming video service, Kanopy. Join in the zero waste movement with titles such as A Life Less Throwaway: The Lost Art of Buying for Life by Tara Button. For the more academic or politically minded, we have titles that cover environmental science as well as the history and sociology behind the environmental movement. Explore the seminal work, Silent Spring, by Rachel Carson in print or as a downloadable ebook available through RB Digital. The environment has inspired many non-fiction, prose and poetry writers such as Barbara Kingsolver, Jeff Vandermeer and Wendell Berry. Dive into an exciting anarchist adventure with Edward Abbey in his book, The Monkey Wrench Gang, or join Aldo Leopold for a poetic and historical journey in A Sand County Almanac. The library has books on composting, recycling, homesteading and more. Also, check out our seed library where you can get free seeds to grow your own edible garden. If you've never gardened before, we have information to help you get started. Using your public library is a green act. When library materials are shared by many, it keeps countless DVDs, books and other items out of landfills. Visit your library as a part of your Earth Day (and every day) celebration. This year, we will break out of the traditional conference setup and host the Leon County Sustainable Community Summit outdoors at the J.R. Alford Greenway, 2500 Pedrick Road. Join us on Saturday, March 23 on the greenway for an interactive day to learn about electric vehicles, waste reduction, vegetable gardening, and so much more! What would you like to see in the Library's Newsletter? What questions do you have about the Library? Send your ideas to Scott Joyner at JoynerS@LeonCountyFL.gov with the subject heading I want to know.... and we'll try to incorporate your ideas into future newsletters!